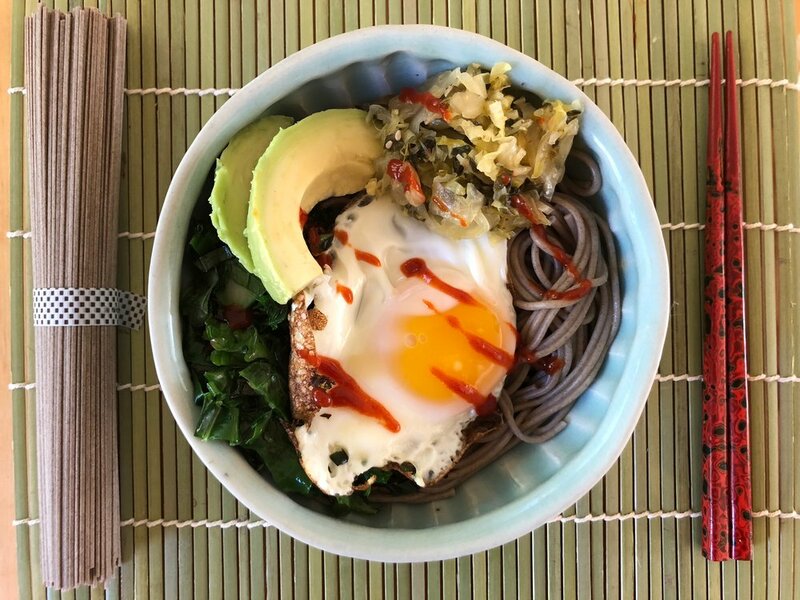 Cook & drain your favorite noodles (I love buckwheat soba), sauté kale or chard with a little chopped onion, arrange in a bowl with Thai Basil Bok Choy Kimchi, sliced avocado, and a fried egg or two. If you like a bit more heat, top with siracha. Yum. Lightly sauté 2 cups green beans and 1/2 cup sliced leeks in 3-4 Tablespoons toasted sesame oil (add a little garlic if you like), cool, then toss with 1 cup Ginger Citrus Carrots & lemon zest. Top with lightly toasted slivered almonds & sesame seeds. Delicious and so easy! Toss 1 cup Alaska Kimchi with 2 cups shredded purple cabbage, chopped cilantro & a dash of sesame oil. Serve with grilled Alaska shrimp. 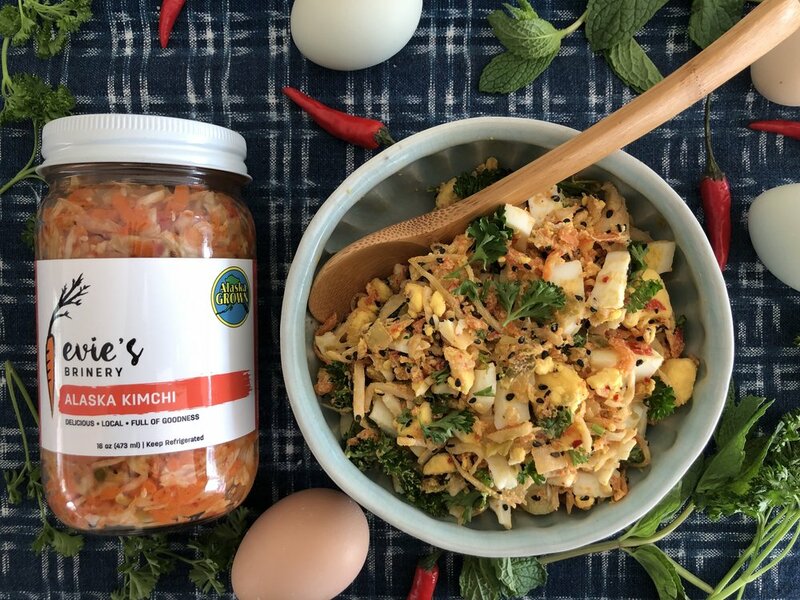 Pack your deviled eggs with flavor - garnish with any ‘kraut or kimchi, or…. Spice it up! Hardboiled eggs, mayo, kimchi. Delicious. Equally good with Gruyere or Havarti on a light sourdough bread. Feeling spicy? Try kimchi grilled cheese with sharp cheddar. Toss fresh Savoy cabbage and radicchio with Cardamom Beet ‘Kraut, top with sliced dried figs, candied walnuts and pancetta. Perfect combination of bitter, sour, sweet and savory. In honor of Chinese New Year try “Longevity noodles” (which the cook is careful not to break - to ensure longevity). 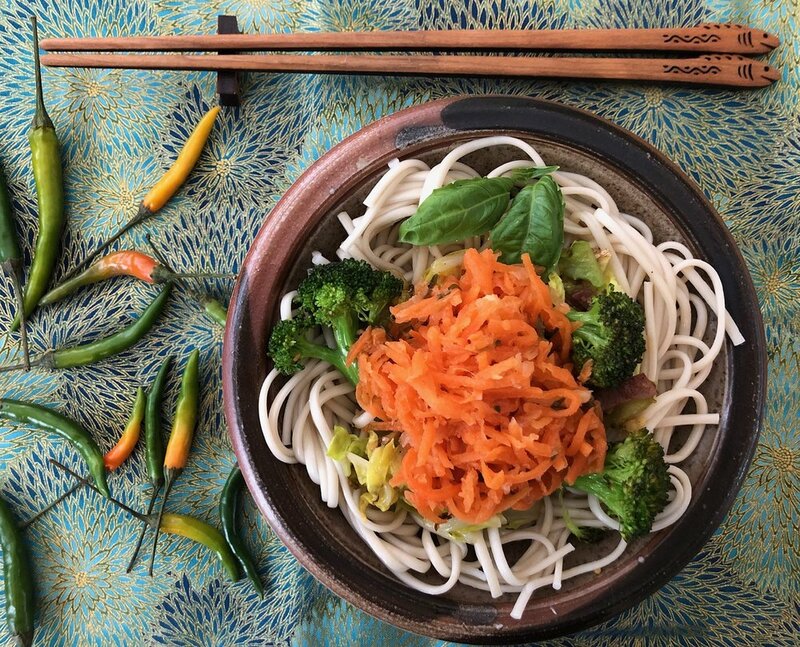 This is my simple take on the tradition: Cook Chinese egg noodles (or your favorite Soba, or Thai rice noodle). Add sesame oil to hot pan and stir fry chopped napa cabbage and broccoli, add finely chopped Thai chilies, fresh ginger and a splash each of soy sauce and rice wine. Top with fermented Carrot Thai Chili Lime and chopped peanuts. Add chicken, shrimp or tofu for extra protein & goodness!